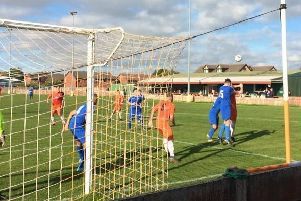 AFC Blackpool’s FA Vase involvement ended on Saturday with a 4-1 defeat at Swallownest in the second qualifying round. The Mechanics were blown away in losing their second game of the season with home striker Alex Lill doing most of the damage with a first-half hat-trick. With first choice keeper Alex Cameron unavailable, Jonathan Broadstock made his debut against Swallownest, who ply their trade in the Northern Counties Eastern League Division One. After early pressure from the Mechanics it was the home side who scored first in the sixth minute when Lill found the net. Five minutes later and the same player headed home a second goal from a free-kick. Carnan Dawson then saw his left-footed free-kick go just wide for the Mechanics. It got worse in the 33rd minute when a mistake at the back created an opportunity for Swallownest. A good through ball to Lill saw him go round Broadstock and slot home to complete his hat-trick and give them a commanding 3-0 lead. Substitute Ben Fishwick gave AFC a glimmer of hope in the 58th minute, slotting home to make it 3-1. A big shout for a penalty was soon waved away by the referee despite the AFC players’ protests. Things got worse late on when Broadstock was sent off for handling the ball outside the box. Midfielder Mike Hall went in goal and the resulting free-kick went over the bar. Ashley Lane completed the scoring for the home side in the 80th minute as they now advance to the first round. It was a disappointing afternoon for the Mechanics, who are back in league action on Friday at Longridge Town (7.45pm). AFC Blackpool: Broadstock, Baird, Betteridge, Mottram, Taylor, Pickering, Bishop, Hall, Duffield, Finlayson, Dawson. Subs: Bradley, Fishwick, Dickson, Penn.